End of Year Fundraising Best so Far! Basepoint Dartford are delighted to have raised £28,831 for our chosen charity, Cardiomyopathy UK throughout 2017. In fact Cardiomyopathy UK confirmed that an event organised by Basepoint licensee, Tom Cella, combined with match funding from The ACT Foundation, raised the highest amount in one event to date. Hundreds of people joined Autism Wessex at the Christchurch Priory for their annual Carol Service on 5th December. 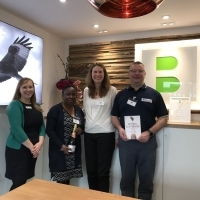 Basepoint Exeter donate £3,704 of match funding to licensee and nominated charity Balloons, who provide a pre and post bereavement service for children, young people and their families. Basepoint Centres are pleased to announce building work on a new Enterprise Centre in Chichester, in partnership with Chichester District Council. Action Coach, Helen Pethybridge, gave valuable entrepreneurial tips at the Basepoint High Wycombe Networking Hub on Wednesday 15th November.